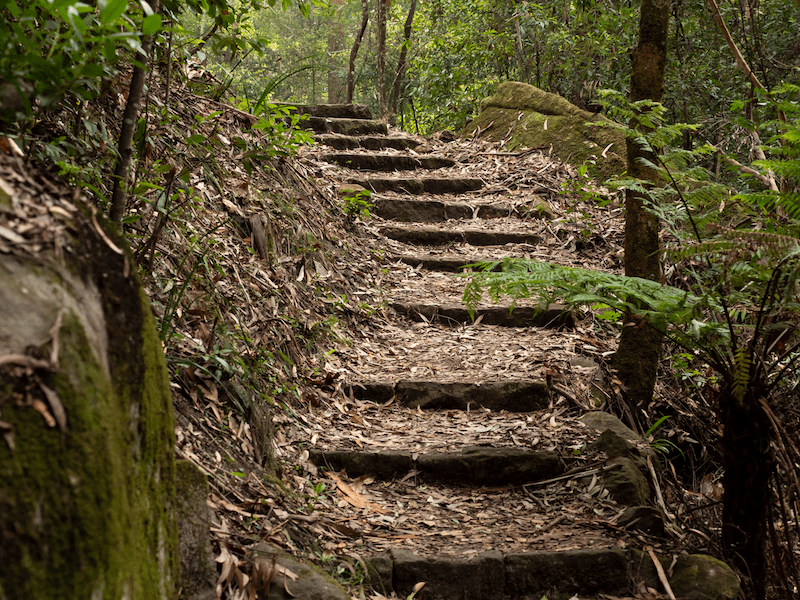 Wandering the paths of Seven Little Australians Park in Sydney’s leafy north shore area of Ku-ring-gai, you can feel that joyousness of nature seeping into your soul. 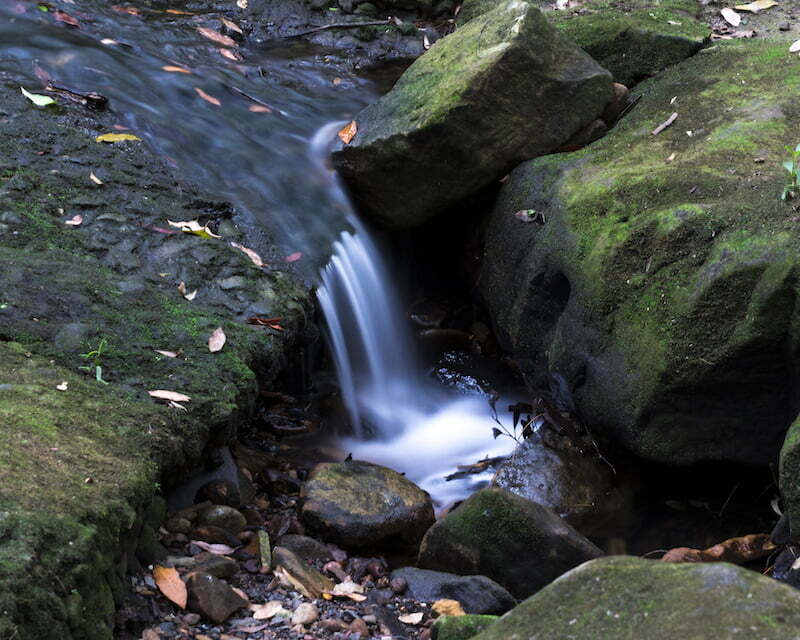 This delightful little park is nestled in the gullies and along the creeks of the leafy suburb of Killara and Lindfield on Sydney’s north shore. 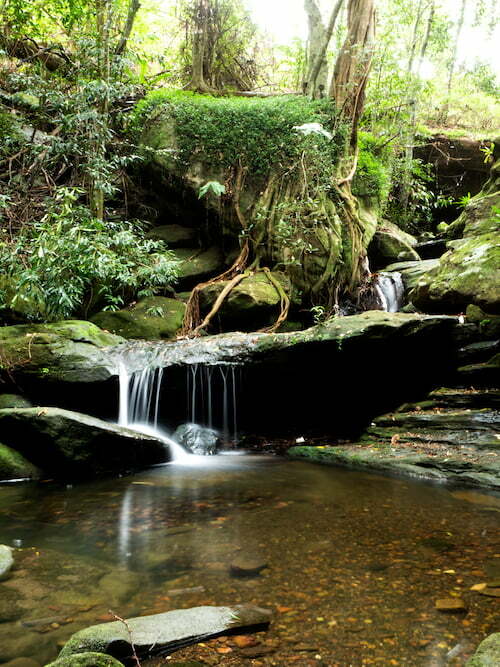 It’s a park steeped in history with its majestic blue gums and Bunya Bunya Pines, beautiful sandstone ledges and escarpments, elegant sandstone paths and stonework built in the Great Depression years and rippling creeks and waterfalls. Perhaps one can sense the echo of the Guringai people who walked these lands for thousands of years before this story began. In 1891, when Ethel Turner, the 19-year-old budding author, learnt that her family was moving to Lindfield, she was appalled. She thought it’d be ‘like being buried alive to live in a quiet little country place after the bustle and excitement of town life’. But she soon changed her tune. 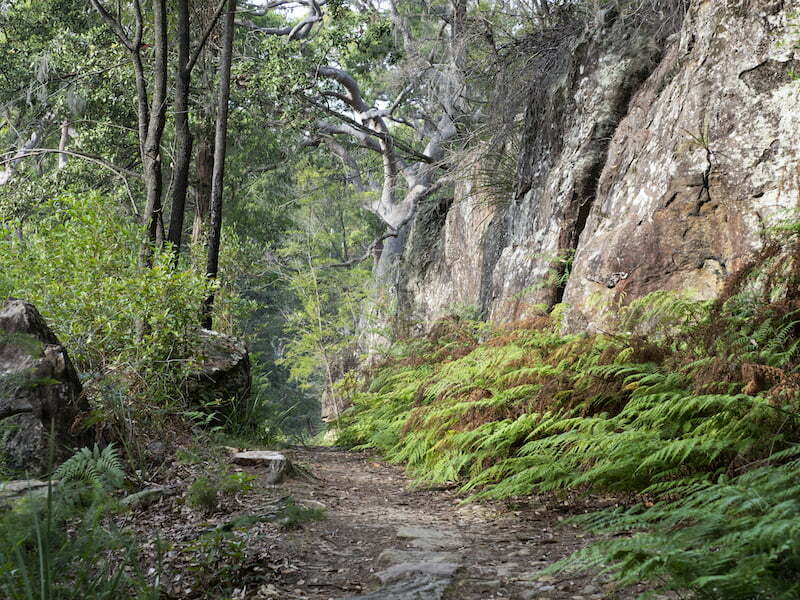 The area of Ku-ring-gai began to flourish as a settlement from 1890, with the opening of the first stage of the railway line. Before that, a collection of isolated rural communities earned their living from timber-getting, fruit growing and market gardens. 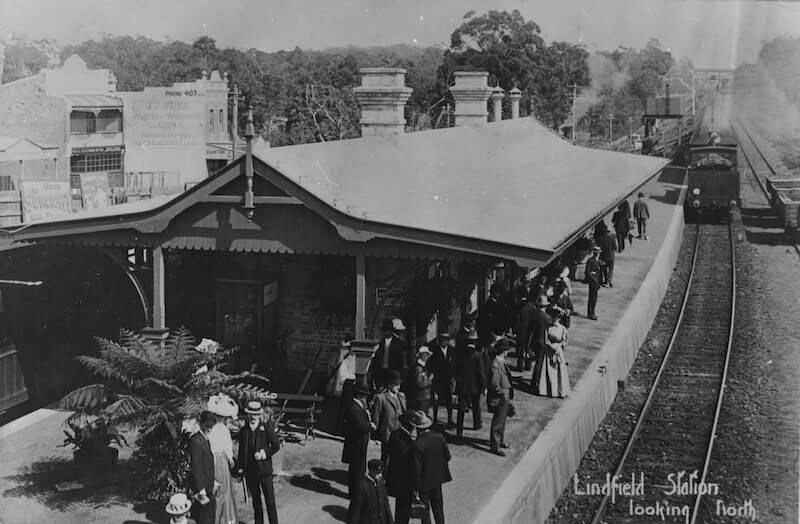 Once the railway was built, it was easier to get into and out of town and Ku-ring-gai blossomed. The foresight of the building surveyors and planners of the time meant that the area adopted the principles of a garden city with individual homes, private gardens and vegetable patches. 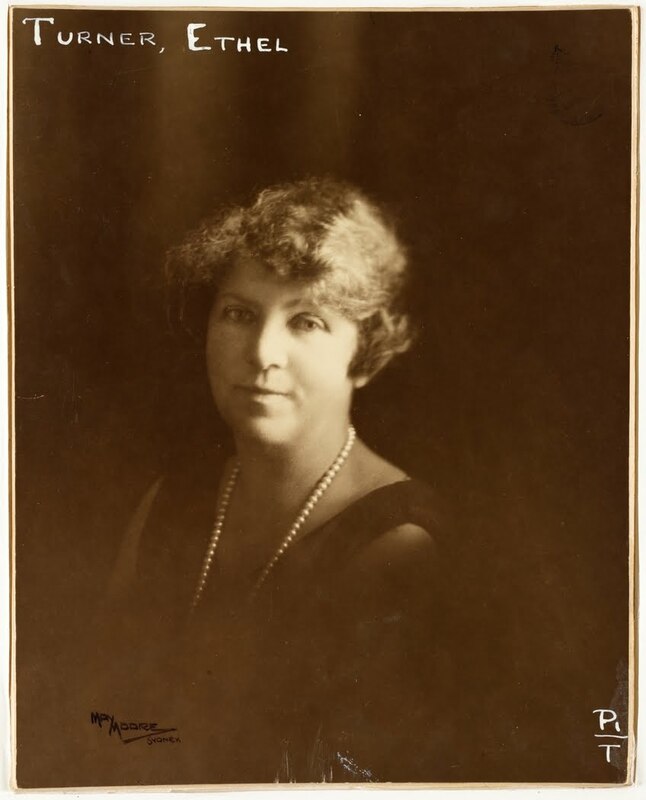 For Ethel, the area was clean and beautiful after the grime of Sydney’s CBD. The house in which she lived was spacious and elegant. 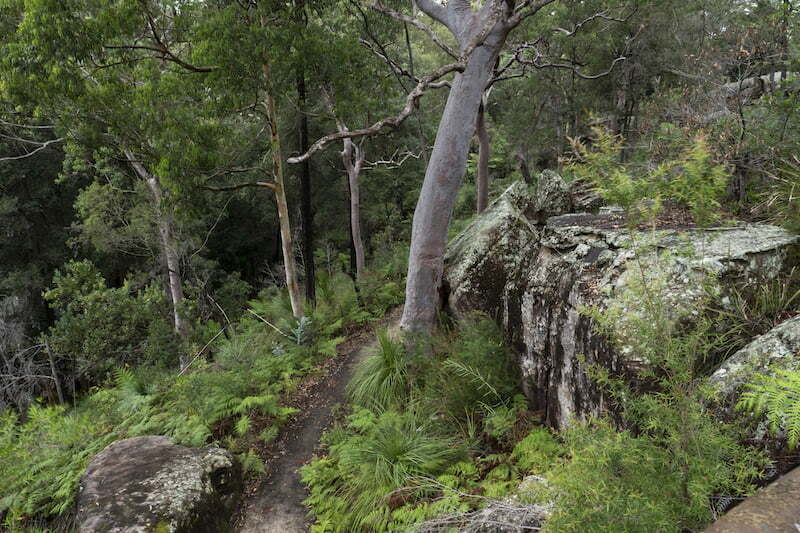 And just around the corner were acres of natural bushland. It was here that she wrote the highly successful children’s book, Seven Little Australians. 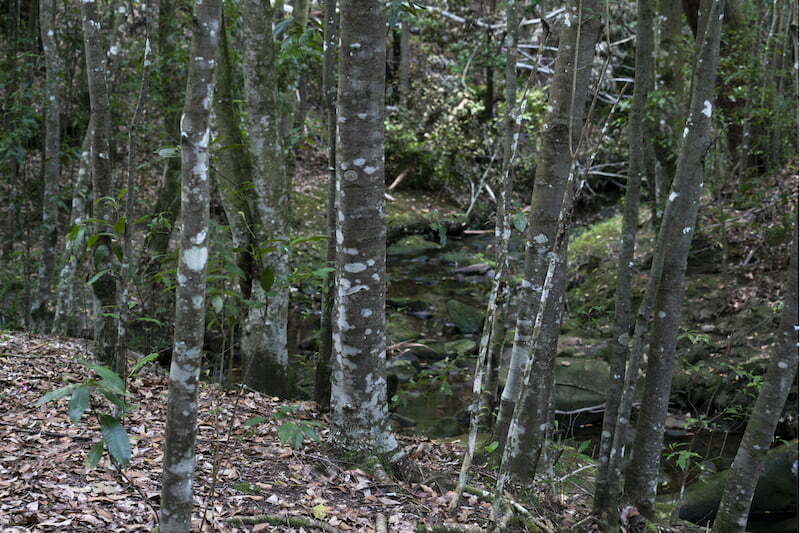 While not set on the north shore, we hope that the pristine bush setting (albeit with all the big trees removed by timber getters) inspired her writing. It was much later, in 1980, that a portion of the park, then called Lindfield Solders’ Memorial Park, was carved off and renamed Seven Little Australians Park in honour of Ethel. 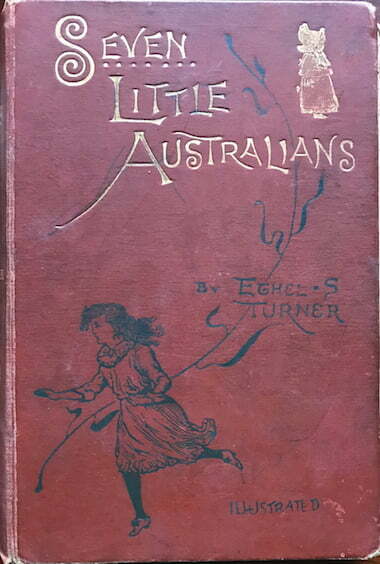 Published in 1894, Seven Little Australians tells the story of seven children living in 1880’s Sydney with their father, the somewhat distant Captain Woolcot and their 20-year-old step-mother, Esther, neither of whom have much luck in exerting any influence over the wayward children. The book has been continually in print for over 100 years. Selling more than 2 million copies in English, it has been translated into many languages and adapted as a stage play in 1914, into a film in 1939, a BBC series in 1953, a 10-episode ABC series in 1973 and a musical theatre adaptation in 1988. Fast forward from Ethel’s writing of Seven Little Australians to the Stock Market Crash of 1929. The Great Depression hit Australia hard. Unemployment soared to 32 per cent by 1932. The Australian Government responded to the suffering by allocating £1,000,000 to the states for unemployment relief. New South Wales received £276,000 of this and with £15,000 of those funds, and another £4,000 from Ku-ring-gai Council, the Eastern Arterial Road was constructed. 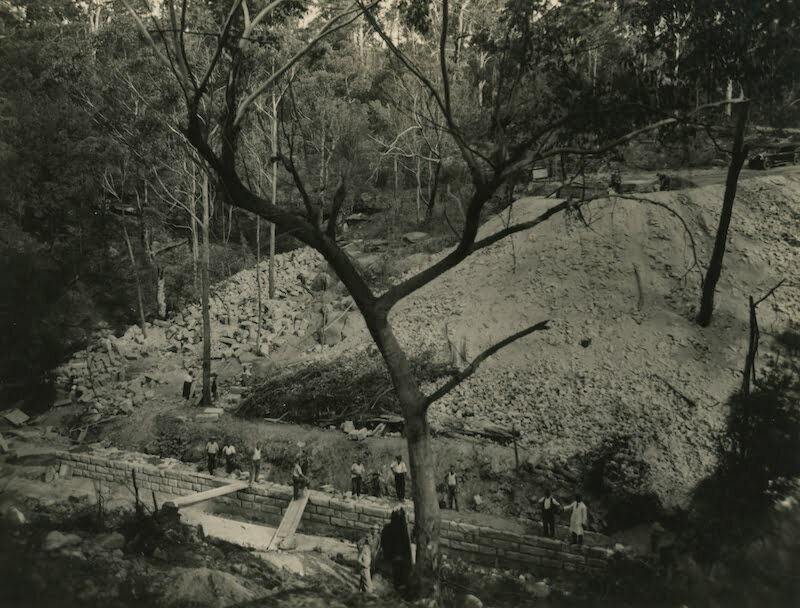 Reaching from Chatswood to Killara and northwards, the aim was to further open up the north shore and provide an alternate route to the winding Pacific Highway. Over 300 men were employed for 5 months to build the road, providing temporary relief for at least some families. As part of that work, the park received a face lift! 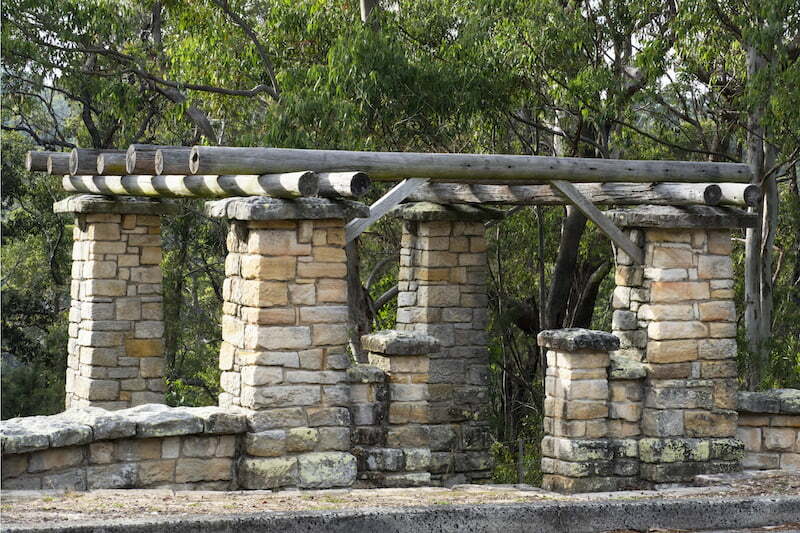 Overseen by RH (Harry) Patterson, the Building Surveyor and Parks Officer at Ku-ring-gai Council from 1926 to 1938, the men employed through the Unemployment Scheme constructed a series of sandstone paths and stairs through Seven Little Australians Park along with the sandstone pillars which reinforce a massive rock overhang. The paths and stairs would have been hand-hewn and placed. A massive effort and still mostly intact today. 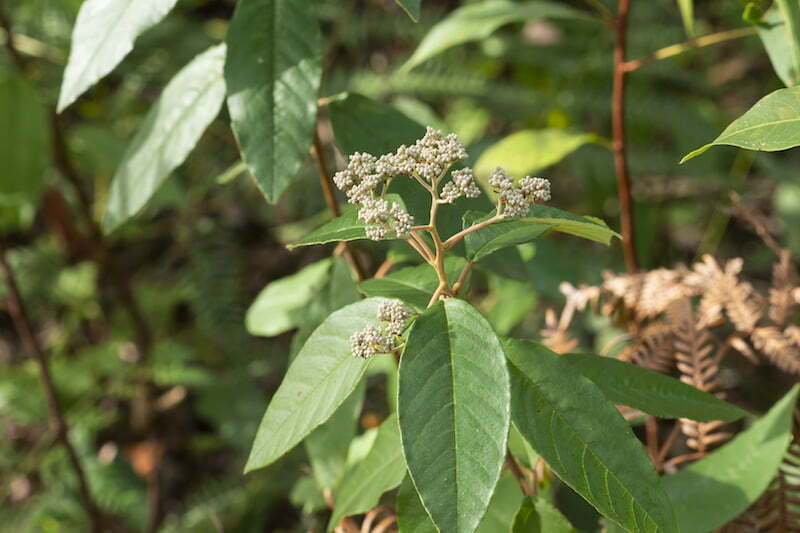 The park itself is situated in a series of gullies, both south facing, where rainforest type species predominate, and north facing, where the slope is more gradual and open sclerophyll forest prevails. The paths meander along the creek line at the bottom of the gullies, both Gordon Creek and Shot Machine Creek, and small waterfalls cascade nearly all the time. In the open forest, Angophora costata (Smooth-barked Apple), Eucalyptus saligna (Sydney Blue Gum), Syncarpia glomulifera (Turpentines), Eucalyptus pilularis (Blackbutt) and Casuarina littoralis (Black She-oak) abound. 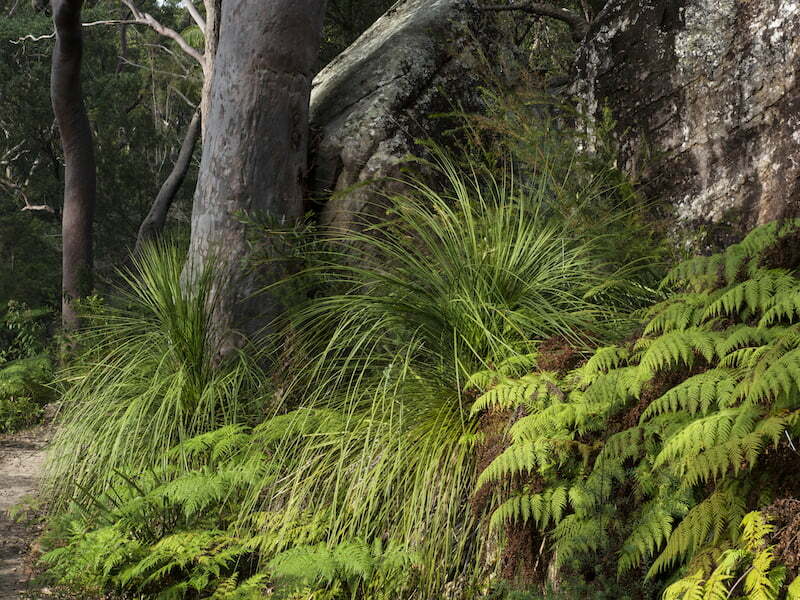 Massive Araucaria bidwillii (Bunya Bunya Pine) and Araucaria cunninghamii (Hoop Pine), thrive along the creek bed, alongside groves of Ceratopetalum apetalum (Coachwood),Tristaniopsis laurina (Water Gum) and Lillypilly. 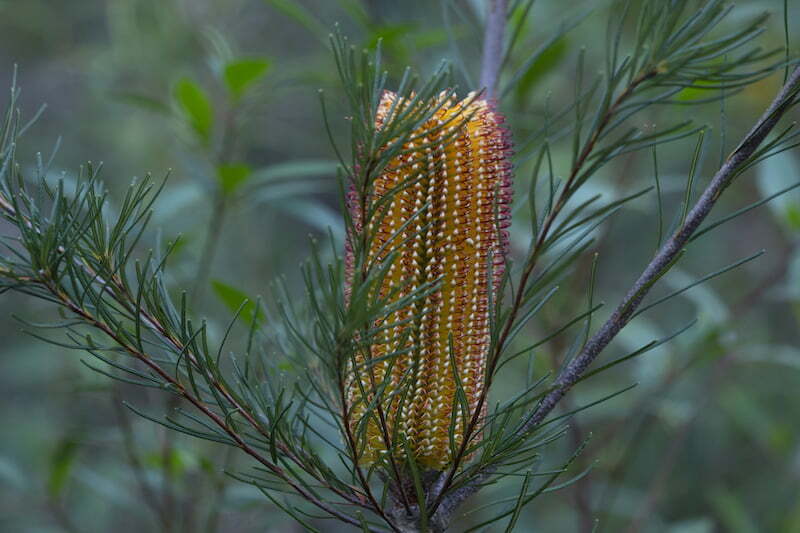 Xanthorrhoea (Grass trees) are prolific in the under storey, as are Banksia spinulosa, Dodonaea, Pomaderris, Melaleuca (Paperbark) and Acacia spp. 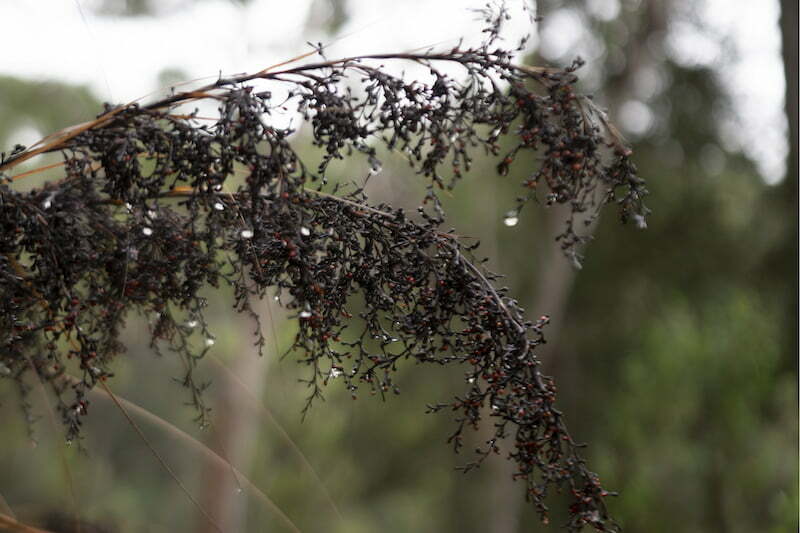 (Wattle). 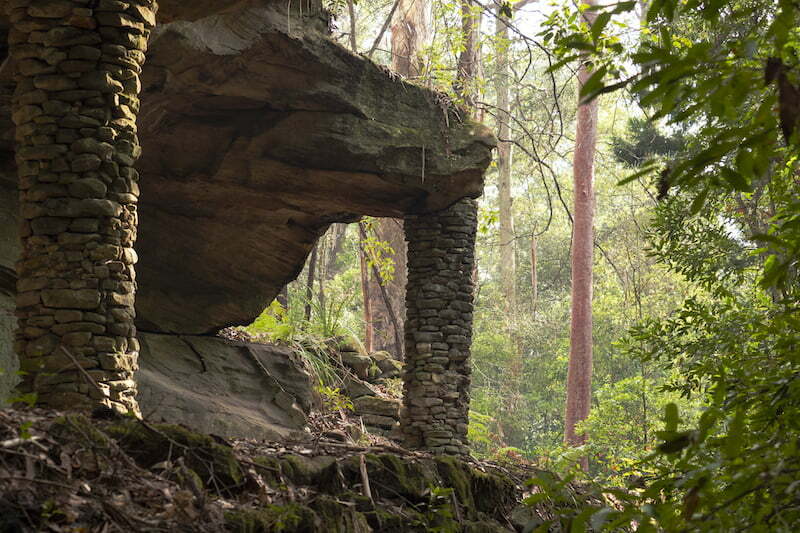 Gahnia, Asplenium (Bird’s Nest Fern) and tree ferns abound. The Crowea saligna are flowering and the acacias are just starting up. 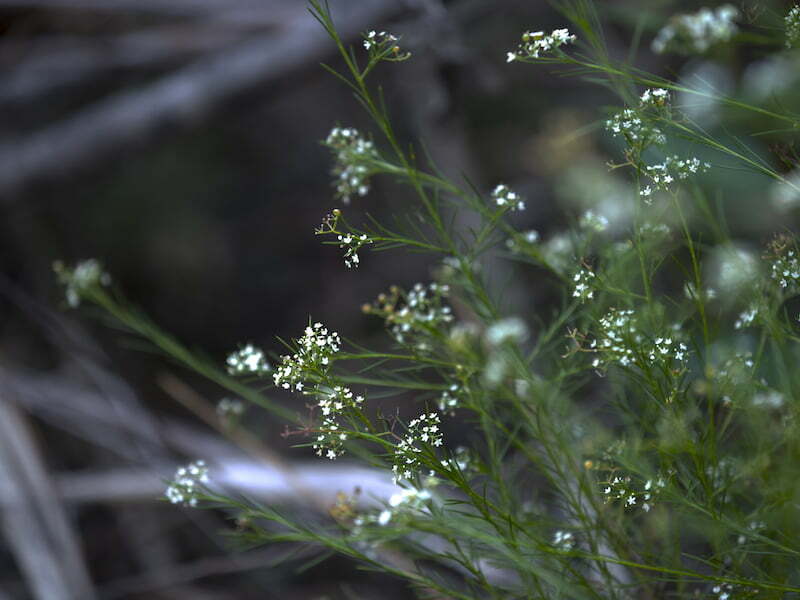 And this little white flowered ground cover, Platysace linearifolia or Carrot Tops, is a delicate delight. This delightful park is a wonderful and restful place to walk and explore. Perhaps you’ll feel, like I do, the history and landscape seeping into your soul, filling you with wonder for both the present and the past. 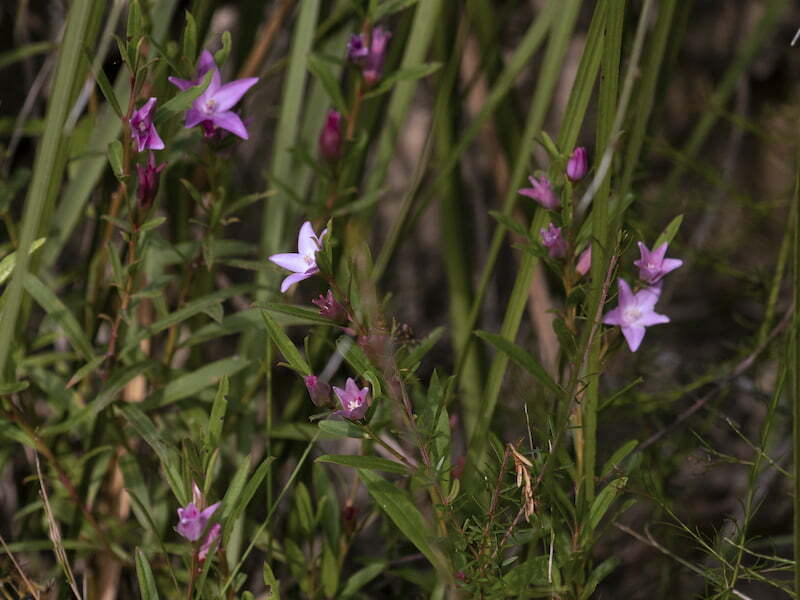 Thank you to Ku-ring-gai Library for their generous support in researching this article.